Taking down the decorations at the end of the festive season can be daunting. This must-read list of tips will help you store your decorations correctly, ensuring you can decorate your home next Christmas, stress-free. Taking down your Christmas decorations is the perfect time to get rid of any that you no longer need or want. Dispose of (recycling if possible) any sets of lights that are not working and can’t be repaired. If you also have old decorations that you no longer love or are broken, this is the ideal time to part with these items. Over the years we tend to collect a wide range of baubles and garlands to decorate our trees; many bring back fond memories and have sentimental value so it is worthwhile to protect them by storing them correctly. 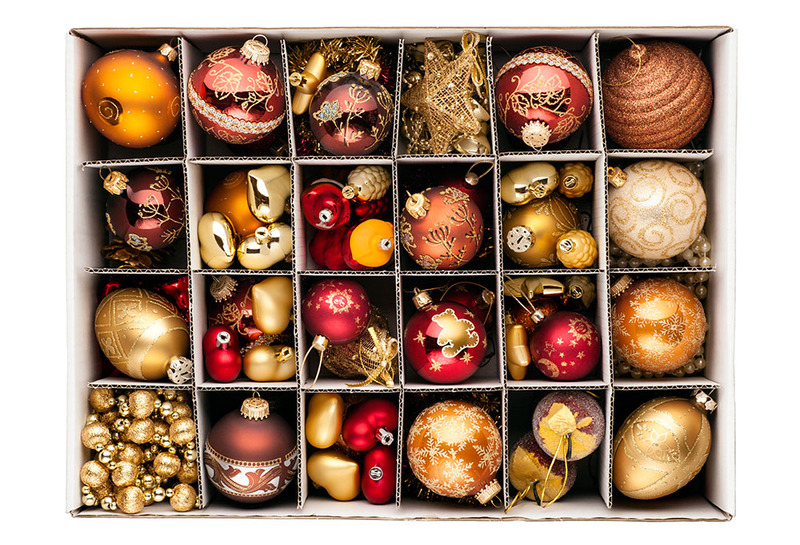 Look for plastic storage boxes or bags, preferably ones with dividers which will prevent the baubles from knocking into and damaging each other. Alternatively you can use an old cardboard box and wrap your decorations individually with bubble wrap or tissue paper. This will help you protect your valued ornaments from dust and weathering. One thing to remember is to try and avoid using newspaper as it can stain your decorations with ink. If you like to know what is being stored where, you can also label your boxes so it will make decorating your Christmas tree a lot easier next year. Your boxes of decorations should then be stored in a cool, dry place. With a small bit of care when putting away your Christmas lights, you will be able to save yourself the time and stress of trying to untangle them next Christmas. One of the easiest ways to store your lights is to wrap them around something as you take them down; you can use anything from a plastic clothes hanger to a cardboard tube. Once the lights have been completely taken off your tree and wrapped up, you can then store them in a plastic container, or use clips or plastic ties to keep them wrapped in their circular shape. If you continue to store your artificial Christmas tree in the box it originally came in, the box will start to deteriorate and become prone to dust, which may damage your tree. You can find storage bags specifically designed for artificial Christmas trees in Topline stores that will keep your tree clean and safe. Sturdy built-in handles also make it easier to carry than cumbersome boxes. Make sure to carefully fold in all of the branches as per the design of your tree to prevent any unwanted warping of your tree’s shape. Yes, our tip applies to both! Cardboard toilet roll tubes are ideal for wrapping around the cord of an electrical extension lead to keep it tidy when it’s not needed for the Christmas lights. The empty toilet roll slit vertically down one side is also perfect for wrapping around a roll of leftover Christmas wrapping paper, to protect it and keep it tidy for next Christmas.